Why is Unemployment Still So High? Paul Perez, 28, who lives at his parents’ home in Whittier, was unemployed for nearly a year before he landed a part-time job in April. He now unloads trucks and shelves goods at a home improvement store for $10.25 an hour. He said he’s happy to be working, but with a master’s degree in religious studies from Cal State Long Beach, Perez aspires to earn more so he can get his own place and begin an independent life. Hmmm. That’s a chin scratcher, isn’t it? I wonder why a guy with a master’s degree in religious studies from a middling state university would be having trouble finding a job during an economic slowdown? I really don’t think you need any esoteric explanations of the recession to figure that out. ravage consumer spending and “acts as a massive drag on the economy.” He also gives a shout out to the deficit mania that prevents the federal government from doing anything constructive about this. Overall, though, he’s trying to tell a story that our current woes are structural, not cyclical. This is tricky. On his list of causes, #1 and #2 are technology improvements and stiffer foreign competition, and I don’t think #1 really holds water. As Lee admits, the IT revolution has been underway for decades, and contrary to what he says, I’m not sure there’s much evidence that “it appears to have accelerated” recently. As Michael Mandel points out, business investment plummeted in 2008 and it’s remained lethargic ever since. It’s just not true that unemployment has remained high even though businesses have been on an equipment spending spree. 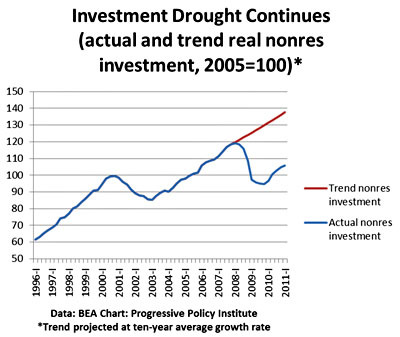 In fact, business investment has been anemic. But #2 — well, I’m not sure. Michael Mandel also has a lot to say about that, and I haven’t really absorbed it yet. He makes the case that measurement problems in the tradable sector are causing us to overestimate productivity gains and that this has profound implications for employment. Oddly, though, considering how provocative his thesis is, it appears to have gotten only scant discussion among economists in the blogosphere. So I’m not quite sure what to think about it. Frankly, the evidence against a primarily structural explanation of the recession still seems pretty strong — I’d guess that the causes of our current unemployment catastrophe are about 70% cyclical and 30% structural — but I’d like to understand Mandel’s argument better. I’ll keep plugging away at it.